BRM Institute defines a business relationship management (BRM) capability as an example of a capability designed to stimulate, surface, and shape business demand across all functions (sales, marketing, IT, HR, finance, etc.) and ensures that potential business value from that demand is captured, optimized, and recognized. A strong BRM capability converges cross-functional teams, eliminates value-depleting organizational silos, strengthens collaboration, and drives a culture of creativity, innovation, and shared ownership across the enterprise. This creates holistic, innovative, and value-driven strategies that deliver their intended business results. As companies look to mature their BRM capability and converge business with IT, HR, Finance, Legal, external partners and other business partners, they are leveraging their BRM capability to evolve culture to eliminate value depleting silos, build strategic partnerships and collectively drive business value. 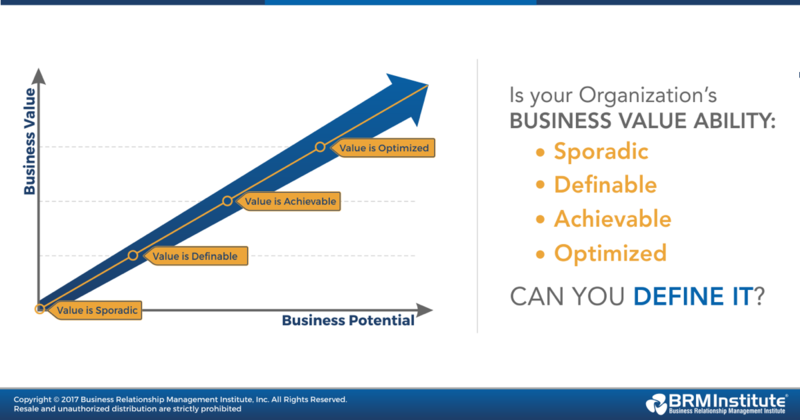 Sporadic– We occasionally do a decent job of defining business value to be realized, but rarely track business results to see if these match the expectations. Definable– We usually define business value to be realized and sometimes track business results to see if these match the expectations. Achievable– We always define business value to be realized and usually track business results to see if these match the expectations. Optimized– We always define business value to be realized, track business results to see if these match the expectations, and capture and apply lessons learned from these activities. To determine your organization’s cultural readiness and business value ability, leverage this Business Value Ability: Organization Assessment, which focuses on the organizational culture and individual behaviors of leadership and employees. These factors impact culture, business value realization and optimization. The assessments guide participants through a simple technique for assessing business value ability and cultural readiness across the organization and surfacing BRM capability maturity, gaps, as well as opportunities to improve. The Business Value Ability Organizational Assessment is supported with the book Business Relationship Management: BRM Playbook. The Business Value Ability Organizational Assessment is a BRM Institute Knowledge path application that serves as an a cornerstone of the Strategic Partnering Approach Workshop, where participants leverage the assessment results to create a baseline for their journey map to achieving converged strategic partner for their business function. Any organization looking to evolve enterprise culture, build strategic partnerships, and drive business value through optimized success of their BRM capability will benefit from this assessment.